OK so let’s get one thing straight right off the hoof: If you order “Cheese & Biscuits” in a restaurant… what you will generally be served are more properly called crackers. With a few exceptions of course… sometimes a Digestive biscuit will creep in there (and with good reason – they are yummy!). The “Biscuits” served for cheese are generally thinner, less sweet, and crispier than true biscuits, and as a cheese and crackers fanatic I feel it is important to clarify this highly significant linguistic anomaly, and ensure that the humble cracker has its rightful place in the sun. With that said … why am I such a fan? Well it’s simple really… my dreamy cheese triangles are a perfect partner for a cracker (if you don’t believe me – you can watch the story of how they met and fell in love in 2016), and together they form the foundation of any sort of snack you might desire… indulgent or classic. Sweet or savoury. It’s all about finding the right combination. Don’t know where to start? Never fear! I have compiled a list of my favourite combos below. Crackers and cheese with chocolate…this original dessert has all of the makings of a superstar! The smooth flavours of chocolate, complimented by sweet and refreshing mango, creamy cheese and a pop of exotic chilli will help you escape for an exotic moment with this tasty snack! Bored of eating the same old classic cheese and crackers snack? Try this sweet and salty variation. Place a portion of The Laughing Cow Original onto a cracker, top with salted peanuts drizzled with thick, oozing maple syrup sauce – enjoy! If you are crackers for cheese, this is a great idea for a late night snack – a great mix of The Laughing Cow Light with Blue Cheese, Chutney and beef that will wake up your taste buds for sure. You can’t go wrong with The Laughing Cow Light cheese and biscuits, strawberries and icing sugar. To impress your guests or have a lovely moment with someone special, just serve it with a glass of champagne! These citrus and cucumber roll-ups are tasty, sophisticated and attractive: Perfect to for a sophisticated snack, a delicious sharing platter or buffet option. A quick fruity snack to get you going in the morning. Spread The Laughing Cow Extra Light on each cracker and add slices of figs and a bit of pomegranate juice for a delicious light breakfast! 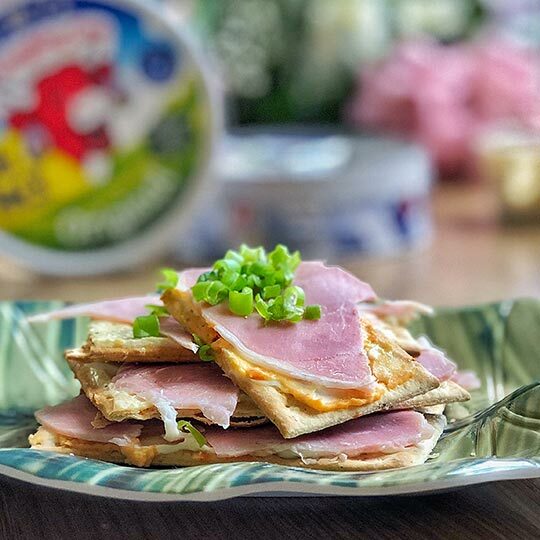 I’m always looking for easy snack recipes – this is one of my favourites, a simple cheese and biscuit snack to enjoy with friends, easy to prepare and delicious to eat.